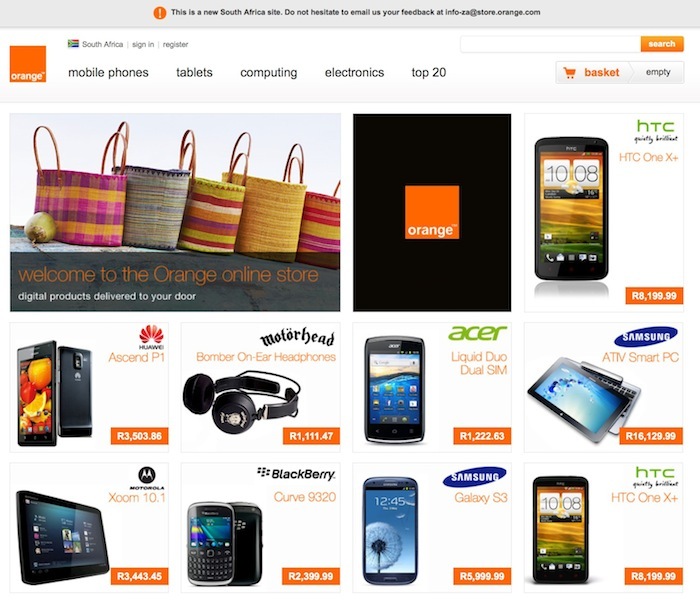 Browsing for the latest tech goodies, at affordable prices, on the new Orange SA online store. So just in case you thought that we were trapped with just MTN, Vodacom, Cell C and 8ta, the French have moved further south and have launched in South Africa – although it will be a while before we possibly see them roll out as a network operator. Instead, Orange has launched Orange Horizons, a new subsidiary that offers services outside of the network operator services. So why the hell should we care? Simply because, France Telecom, the parent company of Orange is in partner with Deutsche Telekom when it comes to the buying power of gadgets and techie goodies – in fact that are the world’s largest purchaser. And this means that they are able to offer huge discounts on to us. The store offers a wide variety of products and handsets, some at seriously discounted prices. For instance, the Samsung Galaxy SIII sells for ZAR5999,99 on the Orange store, while most retailers have this going for prices closer to ZAR7000.00. Also, exploring the store you will also find other great gadgets that are not easily available in SA as yet, for instance, the Sony SmartWatch and the Amazon Kindle Fire HD. And to top it off, instead of having to wait 3-5 weeks from other online suppliers, Orange promises delivery within 3 business days (subject to there being stock in the warehouse). The online store is definitely worth check out, even if you just want to get your usual fix of tech gadget browsing without having to go to the mall. It’s still very exciting to see that SA has been included in Orange plans, especially since they are so prominent across Africa. We just hope that the future brings further expansion plans and that we get the open to jump ship to Orange, and benefit from their years of global experience as a true and trusted network operator. There’s a projector in my pocket!